On Monday I was nominated for the “One Lovely Blog” Award by The Souzapalooza Blog. As a newly minted blogger, this encouragement is very rewarding, especially from such a seasoned blogger. Souzapalooza lives in Westchester, and among her many other interests, loves Bikram Yoga. I have enjoyed her comments on my blog and hearing her thoughts on her practice. It is always a comfort to know that you are not alone in your struggles. 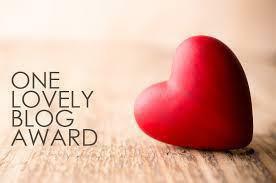 Thank you Souzapalooza for your interest in my blog and for the “One Lovely Blog” award! Thank you, Souzapalooza for the shout out! 1. I live in NYC with my husband and two children, aged 11 and 9. 2. I have a 40-50% hearing loss in both ears. It is genetic and started in my 20s. My father and grandmother had the same issue. I hope everyday that my children will be spared. 3. I love Bikram Yoga — I guess that is not that much of a surprise given my blog! 4. I am very organized! I love making lists and checking things off the list when they are done. 5. I spent 20 years working on Wall Street but am now involved in non-profit work related to finding a cure for hearing loss and tinnitus (ringing in the ears). Check out Hearing Health Foundation for more information on this important work. 7. I love walking and hiking! I wear my Fitbit everyday and get very excited when I hit my 10,000 step goal for the day. I also track my sleep on the Fitbit, which is really fun. I will nominate the following blogs — I am very new to this so can’t get anywhere close to 15! Views From the Podium – This is a blog written by a Bikram Yoga Instructor. I really enjoy her insights into the Bikram Yoga practice and her unique perspective as a teacher on the yoga that gives me so much. This is coupled with stories of fellow practitioners who are doing great things outside of the hot room that are always inspiring to read. Hearing Health Foundation Blog – This is a blog written by Hearing Health Foundation. It is a great blog that shares tips and information for the almost 50 million Americans living with hearing loss and tinnitus. It is also a comfort to those who have family members or friends with hearing loss. Grand Piano Passion – This is a blog written by a fellow Hearing Health Foundation volunteer and board member that discusses her return to piano playing as an adult. Check it out for interesting insights into reclaiming your passion as well as being a musician with hearing loss. I am really enjoying blogging. Thanks for all the encouragement! well deserved! i love your yoga posts.